Eve’s Toy Shop is a shop selling traditional toys for children. Jayne first approached us in 2014, with a rebrand in mind, requesting some print leaflets. After the success of Eve’s Toy Shop’s leaflets, Eve’s Toy Shop asked us that we redesign and rebrand her website. Being based in Llandeilo, a semi-rural area of Wales Eve’s Toy Shop decided that a fresh website including an online e-commerce shop was the necessary next step. We gave the website a patchwork-type design, which matched well the types of toys Eve sells. We wanted it funky, fun and fresh. In terms of print work since, we have designed and printed vouchers for her, as well as a downloadable/ printable Buying Guide, to support and encourage her customers during shopping. Full CMS training is always provided with our packages and all websites are fully mobile responsive and optimised for various devices and screen sizes. 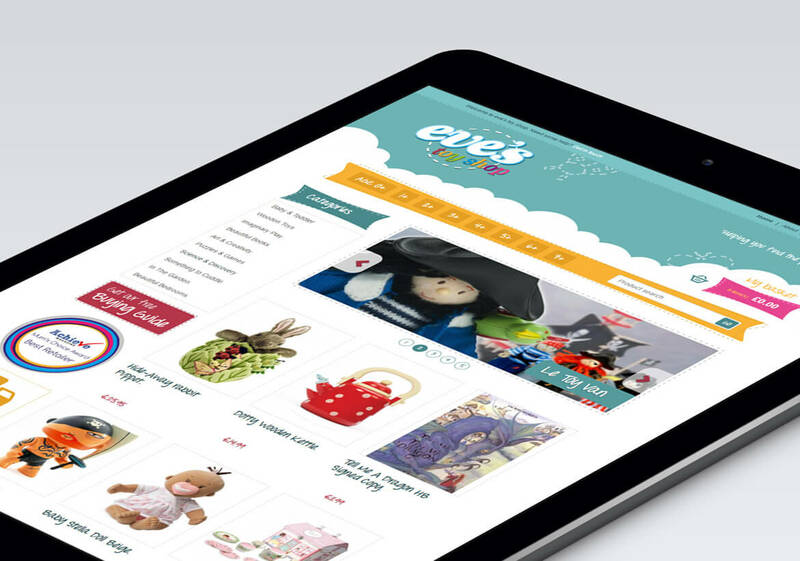 Other web activity we do for Eve’s Toy Shop includes Google Adwords, Google Shopping and email campaigns. Being based in Llandeilo, a semi-rural area of Wales Eve's Toy Shop decided that a fresh website including an online e-commerce shop was the necessary next step. We gave the website a patchwork-type design, which matched well the types of toys Eve sells. We wanted it funky, fun and fresh. Copper Bay helped us not only create a website which we love but also a bespoke booking system. Since having this in place it is so much easier for our clients to make bookings to our leisure site through our website. Copper Bay have also helped us reach more customers by managing our Google Ad campaigns and our Facebook page. We definitely look forward to continuing our work with the team in the future.